Not really trackable, but not sure where else this would fit. Anybody collect them? Anybody ever get one of their own made? I'd like to get my own, but it's hard to justify spending $100 on something I'm just going to give away. I have. Don't give them all away. The PT site is well designed for trading among members. Once you get them and mark them available for trade, you'll get plenty of offers. 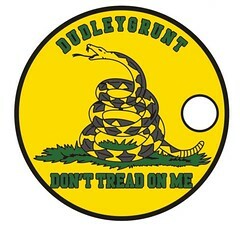 My first, based on the American Revolutionary era Gadsden Flag. I'm out of these for now and am considering one of a couple designs - either another AR era flag (the Liberty Tree) or one based on my MD Flag design used in my avatar (Calvert Cross over the Baltimore colors). I used my crude graphics abilities to put that together. We have had them for about a year and trade as well as leave some to find in a special cache. We made lots of trades at West Bend Cache Ba$h and made some friends by doing this. They are trackable on Pathtag web site with a map and they have lots of other features on the site. We met some people who have 6 or more designs. Lots of fun looking at them in plaques on the wall. Well worth the investment for the fun we have had and friends we have made. Most trackable coins and bugs we have went missing anyway and they are more expensive to replace. Found my first Pathtag a few days ago and it led me here. No OC caches near me, yet. I also can't justify spending $100 on tags to trade away. What kind of wall placque holds them anyway? Not really sure what sort of racks hold them either. I put mine in coin holders. The quarter size ones work perfect. I also use the quarter holders. I use the white cardboard holders, staple them closed and put them in the 3-ring binder holders meant for them. I get these at a local coin shop. I make and sell oak Pathtag wall plaques that hold 24 and they can be placed in the correct orientation since lots of Pathtags have the hanging holes in an odd spot. If anyone is interested let me know. I think it's nice that you can talk about Pathtags on this network without getting slammed like on GC. We have been making and selling Pathtag Displays for several years and it was suggested that we offer these for sale here. The standard wall display is 5" x 7 1/4" and holds 24 tags.The tags mount in a reccess and can be positioned in the correct orientation for the design. They are easily removed and replaced. We have in stock Philippine Mahogany/Lauan, Oak and Cherry(very limited) woods. All have a Danish Oil finish and wall hanger. These are priced at $11.00 each plus shipping. Shipping by Priority Mail is $5.00 for 1 or 2 displays. We also make custom displays on special order. Special wood,finish or sizes are available. Please contact us to order or to have a custom one made for you. Pictures are Phillipine Mahogany/Lauan, Oak, Cherry. The Searchers wrote: We have been making and selling Pathtag Displays for several years and it was suggested that we offer these for sale here. I was going through the forum looking for old spam that got by us in the past (because I really, really, hate spam). I thought this thread was worth a bump, these sound really nice. The images are not showing up though. But if you reply to this post, you see they (used to be) hosted at terracaching.eu.